It sounds like an odd feature to have (and never crossed our minds at the beginning). Yet, more and more users requested it, and in their context it made a lot of sense. In the end, we now believe this functionality is of vital importance to strengthen Godot's adoption in the future. 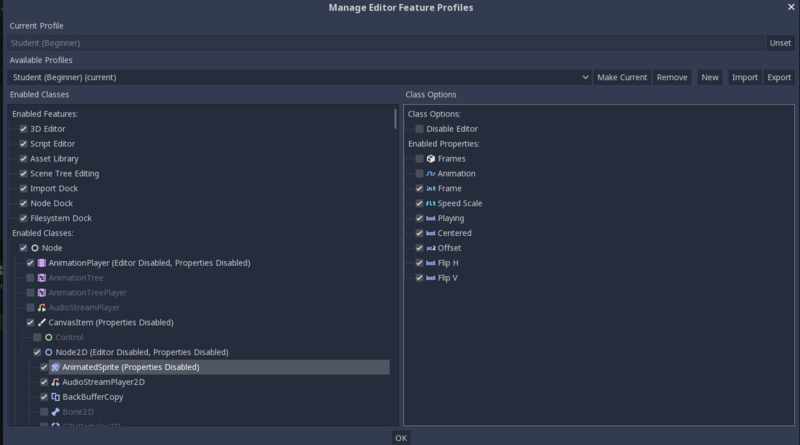 General features, such as the 3D editor, script editing, or asset library. Properties for any enabled class can be hidden (for disabled classes all properties are hidden by default). 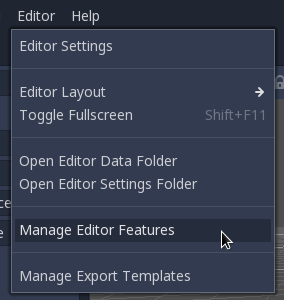 Finally, it's also possible to disable contextual editors for any enabled class (animation editor, etc.). Additionally, these profiles can easily be changed, imported or exported. For real-life use cases in medium to large companies, we got requests for restricting what non-programmers can do to only what is needed for their job. This helps avoiding accidental mistakes, especially when they are undergoing training or they work in a very contained area of the project.